Lol, yes, I remember that, but I didn’t know that method had a name. I came back to Canada with a suitcase full of Tim Tams, only to find out that they’d started selling them here while I was away. Boost bars were another weakness, and yes, I’ve found those in Canada too! I completely agree … why didn’t any one think of this before?? A delicious chocolate biscuit to slurp a delicious beverage with … where do I sign up!! In anticipation of reading this post, I walked downstairs to my apartment building vending machine and bought a chocolate bar (which I proceeded to eat before I finished reading/watching your post…) because I already knew I’d be craving chocolatey goodness. OH MY GOD. I am so glad that I haven’t done my weekly grocery shopping yet, because I am so buying one of these when I go (according to the directory, they sell them at my local grocery store…yay!). I laughed out loud at this blog post (and again when the man in the video assured us that there is in fact no “searing pain” resulting from the slam). I can’t wait to try this! 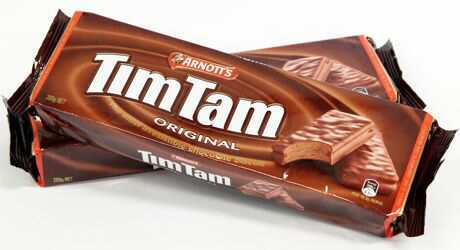 Hi Tiana – you will absolutely love the Tim Tam slam! Even if it gets messy and embarrassing and you drop the cookie in the tea/coffee/hot chocolate, you won’t care because it’s that darn delicious. My level of anxiety about moving back to Canada has decreased knowing that Loblaws sell them. They say you can do the same with Twix but I haven’t tested it. I don’t think it would work because the Tim Tam as a creamy centre which melts as the beverage is sucked up but the Twix is all cookie, so I would think that it would just disintegrate before you get any tea. Let me know how it goes! I’ve got to try this, Amanda! I love the step-by-step instructions 🙂 Great idea to embed a video into your post. Thanks Zannat! There’s nothing better than seeing someone actually do it. Writing out the instructions doesn’t do the ‘slam’ justice!